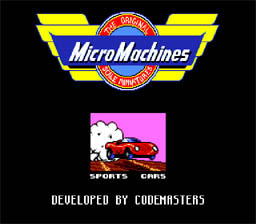 Micro Machines on the Genesis was the same as it was on the NES, except the graphics were better. It's a lot like RC Pro AM in the way that it is played. The biggest difference was that you got to choose your own opponents. There were also a lot of different vehicles you could race, instead of just cars. Micro Machines were really big when I was a kid. I only had a couple, but a few of my buddies had a ton! I think the most memorable thing about Micro Machines is the guy on their old commercials that talked really fast. He was crazy. Micro Machines is a whole lot of fun, so give it a try! Race against other Micro Machines in order to expand your collection. Be careful when taking shortcuts, if you cut too much of the track, the game will blow you up when you try to get back on track.